Here at HCSupplies, we offer a large range of bathroom and kitchen designs with our fantastic sales team ready to help and get your purchases delivered within 2-7 days of purchase. HCSupplies takes great pride, in being one of the UK's Cheapest retailers of thousands of products. This is due to our constantly progressive relationships with our suppliers, with this great benefit we can then pass on the savings to our customers. 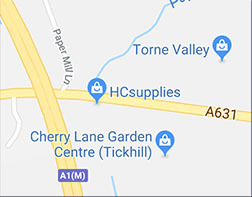 HCSupplies has its very own stylish showroom in Tickhill, Doncaster. We offer a brilliant selection of high quality products from around the globe. Our customers are always happy with the their products as we only sell the highest quality of goods. If you have any questions for us then call our dedicated sales support line on 01302 741 709 and a member of our sales team will be waiting to take your call. We offer a full design service for Kitchens and Bathrooms within a 30-mile radius of our showroom although we are able to deliver products anywhere in the U.K and internationally if required. How Can I Find HCSupplies? During Autumn and Winter 2016, We will be expanding our online catalogue to include Bar Stools, Sinks,Taps & Bathroom Furniture.